Publication of this book is timely, though the publishers make nothing of it on the jacket. This year marks the centenary of the founding of the US National Parks Service, that great project, as Sjöberg has it, designed to ensure that “virgin reserves should be placed here and there throughout the country, like Sundays in a landscape of weekdays”. I’ve read a lot of pieces commemorating the anniversary (August 25), but none has made anything of the role played by a couple of Swedes. Sjöberg, in his eccentric way, gives his countrymen their due. The Art of Flight is actually two books: the one bearing that title is followed within the same covers by The Raisin King. 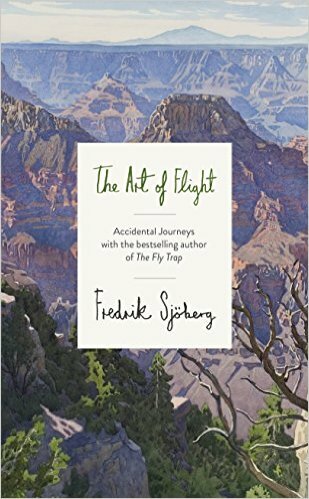 Together they form a loose trilogy with The Fly Catcher, published in Britain in 2014, in which Sjöberg demonstrated a talent for making bestsellers out of the little things in life. The Fly Trap is ostensibly about catching hoverflies on one tiny island east of Stockholm, but for Sjöberg, who is a literary critic and translator as well as an entomologist, the hoverflies are really props. His mission is to “say something about the art and sometimes the bliss of limitation”. In The Art of Flight, he traces the life and works of Gunnar Widforss, a wilderness artist virtually unknown in his native Sweden but revered in the United States for watercolours of near-photographic detail (there’s a Widforss Trail and a Widforss Point at the Grand Canyon and his paintings sell for more than $100,000 at auction). Reading Sjöberg ought to be maddening, for he proceeds by diversion, digression and detour, but he’s worth following just for what he uncovers in passing. In The Raisin King, he reveals that a German entomologist in Slovenia, in 1933, named a beetle after Adolf Hitler. Today, Anophthalmus hitleri is threatened with extinction. Why? Because a specimen can sell for a thousand euros to the sort of fetishists who collect SS badges and bayonets.